Netflix's Awards Season Party Brings Out Lots of Stars! 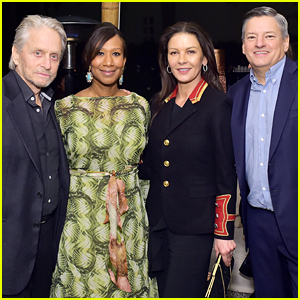 The Kominsky Method‘s Michael Douglas and his wife Catherine Zeta-Jones pose for a photo with with Netflix Chief Content Officer Ted Sarandos and his wife, Nicole Avant, at the 2019 Nominees Toast held at a Private Residence on Saturday (January 26) in Los Angeles. 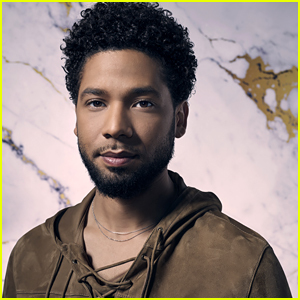 Also in attendance at the event were Dear White People‘s Wyatt Nash, Logan Browning, Antoinette Robertson, Marque Richardson, Brandon P. Bell and John Patrick Amedori, Glow‘s Ellen Wong, Britney Young, Gayle Rankin, Kimmy Gatewood, Rebekka Johnson, Shakira Barrera, Britt Baron, Kate Nash and Jackie Tohn, Fuller House‘s Candace Cameron Bure and John Stamos (with Caitlin McHugh), Ozark‘s Julia Garner, Charlie Tahan and Skylar Gaertner, Better Call Saul‘s Bob Odenkirk, comedians Nick Kroll and Jason Mantzoukas, actor Andy Serkis, and more. 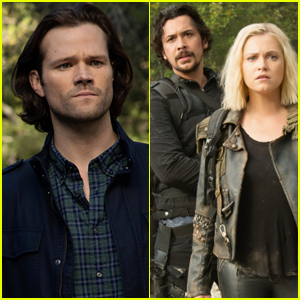 The 2019 SAG Awards are set to air in just a few hours, and some of the nominees tonight include Julia, Bob, and Michael. Best of luck to all of the nominees! Darren Criss hits the red carpet at Entertainment Weekly’s Pre-SAG Awards Party on Saturday night (January 26) at the Chateau Marmont in Los Angeles. The 31-year-old actor looked cool in a black leather jacket over a white and black buttoned-down shirt for the event. 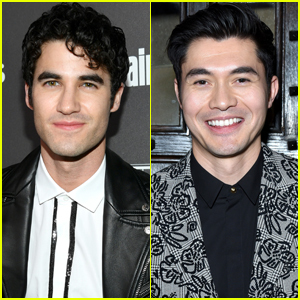 Other stars at the party included Crazy Rich Asians cast mates Henry Golding, Michelle Yeoh, Harry Shum Jr, and Fiona Xie. Guests sipped on Casamigos cocktails at the event. Andy Serkis, John Cho, Lakeith Stanfield, Chris Harrison, Cody Fern, Costa Ronin, and Chris Lowell. FYI: Darren is wearing DSquared2. Henry is wearing a Versace suit. Chris is wearing a Darkoh jacket and Ted Baker London pants. Andy Serkis Brings Back Gollum for Spoof of British PM Theresa May - Watch Now! 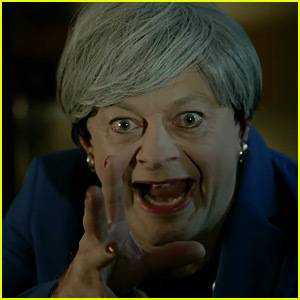 Andy Serkis brought Gollum to life in The Lord of the Rings movies and now he is reviving his character for a spoof of British Prime Minister Theresa May. Serkis performs as Gollum while dressed as May and contemplating the proposed Brexit deal. The video was produced by We Wants It in support of a call for the People’s Vote. People who are not happy with the proposed Brexit deal or who don’t want to leave the EU at all are calling for the people to get a say in the vote. Watch the “leaked footage” from inside No. 10 Downing Street right here. Matthew McConaughey, Hailee Steinfeld, and Miley Cyrus snap a pic together during a visit to The Graham Norton Show! The 49-year-old Interstellar actor, the 21-year-old Spider-Man: Into the Spider-Verse actress, and the 26-year-old “Wrecking Ball” singer stopped by the show on Thursday (December 6) in London, England. They were joined by Hailee‘s Bumblebee co-star John Cena, as well as Jamie Oliver and Miley‘s “Nothing Breaks Like a Heart” collaborator Mark Ronson. Miley and Mark performed the song during the show. Bumblebee director Travis Knight, as well as Andy Serkis, were also spotted leaving their hotel en route to the show. Watch a couple of videos from the appearance below! FYI: Hailee is wearing David Koma at the show. Naomie Harris Stuns in Dundas at 'Mowgli' London Premiere! Naomie Harris walks the carpet at a special screening of her new movie Mowgli: Legend of the Jungle on Tuesday (December 4) at the Curzon Mayfair in London, England. The 42-year-old actress was joined at the event by her co-stars Eddie Marsan, Rohan Chand, and Louis Ashbourne Serkis, as well as director Andy Serkis. Rohan plays the live-action role of Mowgli while Naomie voices Nisha the Indian wolf, Eddie voices Vihaan the Indian wolf, and Louis voices Bhoot the Indian wolf cub. The movie is based on Rudyard Kipling‘s classic “All the Mowgli Stories” collection. The film debuts on Netflix on December 7. FYI: Naomie is wearing a Dundas dress and Amrapali jewelry. Andy Serkis Brings Back 'Lord of the Rings' Gollum with Impression on 'Late Late Show'! Andy Serkis made an appearance on The Late Late Show with James Corden on Wednesday (November 28) alongside guest Michael Pena and brought back his iconic character from The Lord of the Rings, Gollum! Host James asked the Mowgli: Legend of the Jungle director about doing the motion capture for Baloo, and Andy agreed to show the audience how he does King Kong and Gollum.